Successfully Added Ordro B1 Smart Watch - 1.3 Inch IPS Touch Screen, BT 4.0, Heart Rate Monitor, Sleep Monitor, Pedometer, Anti-Lost (Silver) to your Shopping Cart. The Ordro B1 smart watch is a stylish wrist accessory with lots of cool features. Coming with Bluetooth 4.0 connectivity, a heart rate monitor, anti-loss feature and more. The Ordro B1 comes with a nice 1.3 inch IPS touchscreen display and features Bluetooth 4.0 support — so you will enjoy reliable communication with other Bluetooth devices and smooth data exchange with your smartphone. 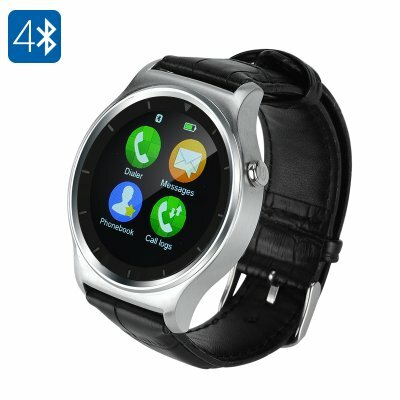 The smartwatch is compatible with Android 4.3 to 5.1 devices as well as iOS 7.0 to 9.2 systems. Simply hook up the smart watch to your phone via Bluetooth and pick up and make calls right from your wrist, sync your contacts and messages, use the watch as a remote camera trigger and more. With iOS system, you will even have Siri support. In addition to smartphone activated functions, the smartwatch comes with a set of standalone features that are a great help when it comes to your health and fitness management. The watch features a built-in heart rate monitor for keeping an eye on your health, a pedometer for encouraging more activity, a sedentary reminder to making sure you don’t overwork yourself and a sleep monitor to watch over your beauty sleep. A 310mAh battery offers 5 days on standby and this smart wrist watch comes with an MTK2502 processor, 128MB of RAM and 240x240 display resolution. The Ordro B1 Smart watch comes with a 12 months warranty, brought to you by the leader in electronic devices as well as wholesale smart watches..